PUTRAJAYA, 2 September 2014 – Two academics from The National University of Malaysia (UKM), Professor Dr Sheila Nathan and Associate Professor Dr Raihanah Mohd Mydin were today given recognition as outstanding academicians at the National Academic Award 2013 here. Prof Sheila, a biochemist, was given the prestigious award for the Journal Publication Category. She and her team made a breakthrough in uncovering the mystery of the deadly tropical disease Melioidosis. Research findings by Prof Sheila and her team was published in the proceeding of the National Academy of Sciences (PNAS), a Q1 (the top 5%) Journal. The breakthrough made by her team and their collaborative partners will not only benefit the medical field in tropical countries in tackling the disease but the impact of the publication will benefit the whole world. Dr Raihanah, a language expert, was awarded the Outstanding Teaching Award for Literature and Social Science related to her teaching method which has significantly improved students achievements at the university level. Her passion in getting the best out of her students has won her recognition and awards at the faculty and university level and now at the national level. 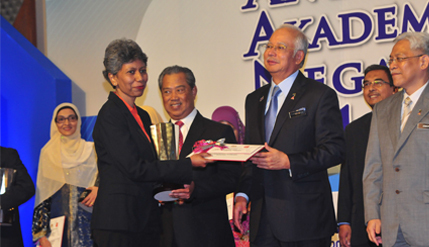 The awards were presented by Prime Minister Dato’ Sri Mohd Najib Tun Razak at the National Academic Award 2013. Present at the ceremony were Ministers, Vice Chancellors from various universities and the nominees. The National Academic Award is the most prestigious accolade in the country awarded to academicians and educators for their outstanding contributions locally and internationally.